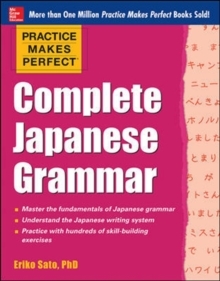 Want to speak Japanese? Don't have a lot of time? 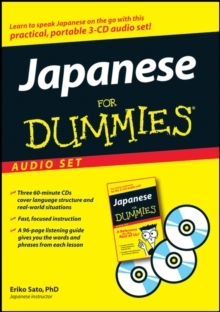 Japanese For Dummies Audio Set is designed to help you learn quickly and easily at home or on the road. From basic greetings and expressions to grammar and conversations, you'll grasp the essentials and start communicating right away. This completely practical, portable learning system lets you set your own pace and skip around to explore topics that interest. 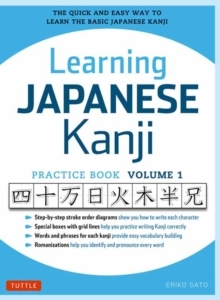 Three one-hour CDs introduce the basics of Japanese, get you familiar with the languages structure, and prepare you to use the language in real-world situations. You can play them on any car or home stereo, copy them to your computer, and load the pre-converted files onto your mp3 to play them wherever and whenever you want. 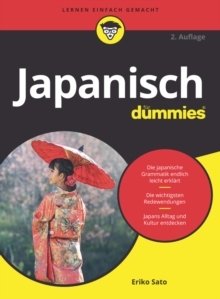 A 96-page compact guide helps you find your way around the CDs and handy Japanese/English dictionary for quick reference on the go. 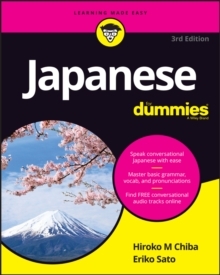 You'll discover how to:* Begin communicating in Japanese on a basic level* Handle greetings and introductions* Ask questions and understand the answers* Build your vocabulary* Talk about numbers, time, and the calendar* Ask for directions* Order a meal at a restaurant* Understand Japanese parts of speech* Form complete sentences and converse in Japanese If you're ready to start speaking Japanese, Japanese For Dummies Audio Set is the most effective, convenient, and friendliest tool you can use.